The Global Marine group is excited to announce the 2B Sure the Environmentally Friendly Anti-fouling system. Now at last there is a new product on the market, which completely takes the worry out of antifouling, no dry docking, no more hull washing, and painting. This new system that keeps your Boat free from organic matters, no matter what the conditions. Designed primarily for all size of vessels, the Anti–fouling system can be also applied on other seawater objects, like Navigation Buoys or be applied on the Sea Bed so that several Boats can be protected at the same time. 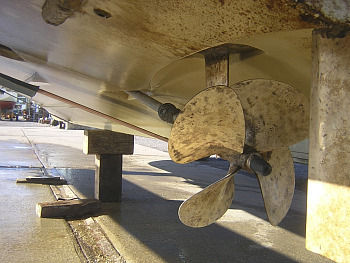 The growth of shells, mussels or barnacles on boats is a well known problem that the owners have to pay for. This counts for Recreational Boaters as well as for the Professional, because the growth of shells does not only lead to a loss in speed and to higher petrol costs but can also damage the ship itself. Cleaning and maintenance or costly Docking systems were up till now the only solution against organic matters on boats. The Anti-fouling system consists of two special mobile electrodes and one control case. Due to the interaction of copper-ions and the electric field that consists between the two electrodes, a protection zone is created. The substances created are environmentally friendly. This is tested and proven by NIOZ (Nederland’s Instituut voor Onderzoek der Zee / Dutch Institute for Sea Research). This protection zone prevents shells and algae from sticking to the boats hull. Therefore, the system has to switched on every time the ship is lying quietly in the water. The Anti-fouling system is easy to maintain and it can be applied on all material (wood, metal, polyester). Solely the electrodes need to be exchanged every few years (depending on how often the system is used). The system runs on 12 VDC but it can be provided with an adopter so that alternative current can be used. As soon as both electrodes are inside the water and the system is activated, the system starts working. On the operation display the status of the system can be metered and settings can be changed. Protect your boat from organic matters with the Anti-fouling system from 2B Sure.